Retro, seductive, smooth, melodic, hip, flowy, sensual…. 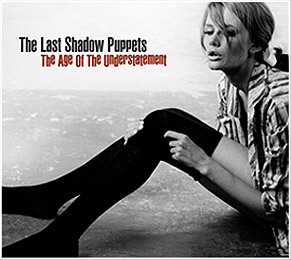 I could conjure up plenty more adjectives to describe for this record but I’ll refrain: The Last Shadow Puppets. For anyone whose familiar with the fantastic foppish foursome The Arctic Monkeys (if you’re not for christ’s sake get the hell outta the cave! ), you’ll recognize instantly Alex Turner’s distinctive lead vocals. This is a side venture for him that does break away from AM’s sound but still sounds as if the foundation of the album was built in Monkey land. James Bond would put this on at his after parties. Secret Agent Man music fo realz! So, grab a loved one, some hot trim, or even just your lonesome self and place the needle on their debut album, “The Age of the Understatement”. This entry was posted in Uncategorized and tagged arctic monkeys, english inide rock, good music, new albums, new bands, The Last Shadow Puppets on September 15, 2008 by Sandra Burciaga Olinger.